Learning to whistle, tying shoelaces, or turning a somersault are all childhood milestones every boy or girl wants to grasp because everyone else can do it. Learning to bike ride is one such rite of passage, but for those with special needs—each of which has a unique set of challenges to overcome like limited mobility, sensory difficulties, or communication/social deficiencies—the opportunity may not always present itself. A study conducted by the University of Michigan reported fewer than 20% of children with autism and 10% with Down's syndrome learn to ride a bike. The goal of the research was to seek out ways that mastering riding a bike would benefit special needs kids in other areas of their lives. Whether learning the "usual" way at home or at a day camp specifically designed to teach bike riding, children with special needs discover (and parents and counsellors can witness) that it has advantages extending to every level. Learning to ride a bike strengthens kids with special needs physically. The exertion of the pedaling allows them to develop the leg muscle organization and endurance they might have lacked before. Bike riding can fine-tune motor skills and physical coordination as well as aid with balance. Building a habit of continued, enjoyable physical activity can lower risk of future cardiovascular problems and obesity and their associated health complications. Learning to ride a bike grows special needs kids mentally. As everyone experiencing the struggle knows, it takes focus to stay upright as he or she masters the task. Grasping the skill to bike ride also requires determination to carry through to the end. But once your child does, the results prove to be well worth the effort. 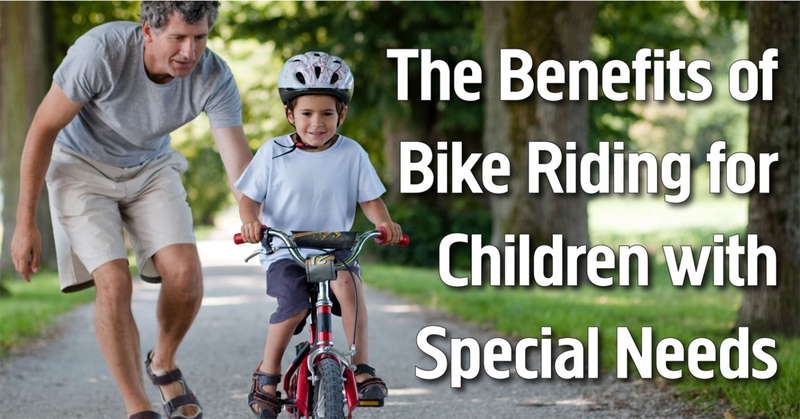 As a result, learning to ride a bike reinforces children with special needs emotionally. Many such kids can attest to the sense of independence they gain as well as the accompanying feelings of freedom, pride, and accomplishment. Because they mastered the bike, they can now work hard to learn new things and have the confidence to succeed in other aspects of life. Learning to ride also helps special needs children develop their social skills since it's an activity the whole family can participate in. Biking is a childhood rite of passage, a milestone which can be hard for those with special needs to conquer. As a skill that everyone learns, many of them can do it with support and practice. For those who find it a little more difficult to achieve on a standard bicycle, companies have developed various adaptive bikes to fill in the gap. More importantly, encouragement from family, friends, and trainers help boost the confidence of children with special needs to succeed. Be the Best Sport is dedicated to the goal and offers that very program to teach them to ride a bike and develop the focus, balance, independence, and social self-assurance they'll need to interact with others and lead fulfilling lives. Michael Furino is the Executive Director of Be The Best Sport, a Long Island based not-for-profit that provides sports enrichment programs to children and adults with special needs. Programs are offered throughout Long Island on weekdays and weekends. For more information or to register for special needs bike riding for your child, please visit www.BeTheBestSport.org or contact Be the Best Sport by phone at 516-453-0990.